I wanted to call a bit of attention to a recent contribution to the theory of why people immigrate. In the August 2013 issue of American Sociological Review, Emily Ryo (currently a fellow at Stanford Law School) responds to the lack of theorizing about differences in why authorized versus unauthorized migrants immigrate. Engaging the literature on legal noncompliance, she includes questions of legitimacy (is the process of getting visas problematic? ; do Mexicans have a right to be in the US? ), morality (is it ok to break the law if you don’t agree with it? ), and social norms (are friends and family making the trip across?) on her survey of over 1,500 Mexican men. In essence, her model is neoclassical economical + legal noncompliance. Several variables from the neoclassical side prove statistically significant and important. Believing it is hard to come by a job in Mexico positively correlates to plans to cross, and believing that border crossing is very dangerous negatively correlates. More interesting perhaps are the legal noncompliance factors. She finds that knowing people who have crossed is most related to people’s plans to cross. Also showing a strong relationship with plans to cross is agreeing that Mexicans have a legitimate right to be in the US. Other moral factors also prove statistically significant and powerful. 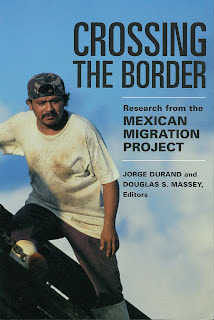 She states, “Continuing efforts by the U.S. government to selectively target and marginalize unauthorized Mexican migrants might thus have the unintended consequence of producing lesser, rather than greater, voluntary deference to U.S. immigration law, as increasing numbers of Mexicans come to question the legitimacy of U.S. legal authority” (Ryo 2013: 593). If you're a Graduate Center professor or student, you can find the article by clicking here. For others, look for the most recent issue of ASR.